Boil water and sugar on a low heat to make syrup. Add all other ingredients, except butter, to the syrup and boil for another 15 minutes. Stir the ingredients with a fork every few minutes. Add butter and stir ingredients to cook for another 6 minutes or until butter is completely melted. Sift flour and salt together. Cut in butter and shortening and add water to make dough. Place dough in plastic wrapping and keep in the fridge for half an hour. Remove the dough from the fridge and roll out, with a rolling pin, on a floured surface. Cut circles (about 8) in the dough and turn up and pinch around the edges (to create a holder for the coconut mixture). Place on a greased cookie sheet and bake at 350 degrees F for 15 minutes. Add the coconut filling and bake for a further 20 minutes. Let cool and then eat. 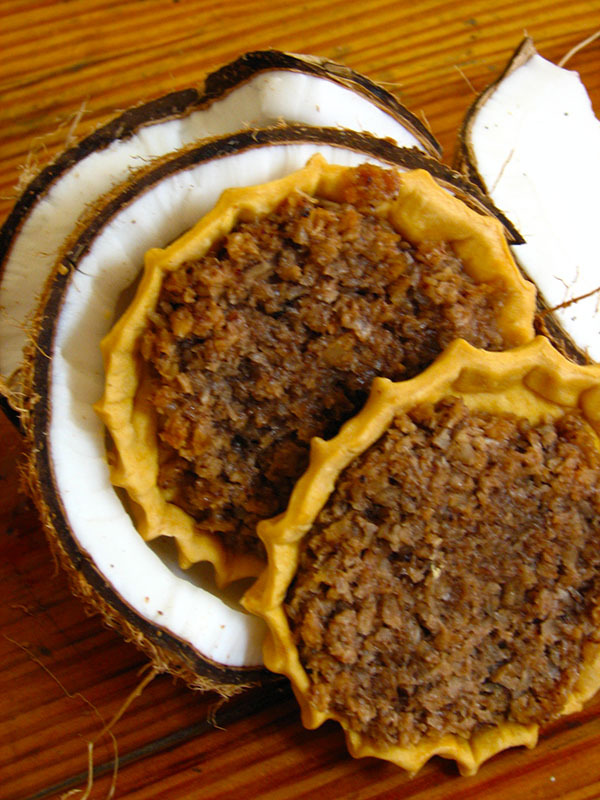 Alternative: Buy small pie shells at the supermarket and spoon in coconut filling. Bake at 350.